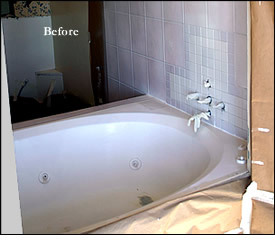 Tub and shower repairs including cracks, holes, chips, rust, soft spots and stains. 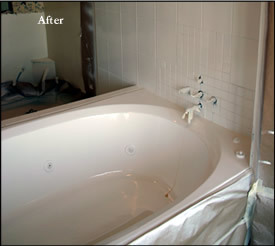 Most tubs we work on are new and have been damaged during installation or in the course of the new home building process. These type of repairs need a flawless finish that JRP techs have mastered. JRP has worked and trained with the top tub manufacturers in the United States. JRP uses manufacturers gelcoat, paint and colors. Old, damaged, stained or scratched - your shower or tub can be refinished to look new again at a quarter of the cost of replacement. JRP Services only uses "A" rated refinishing products. Ask about our 5 year guarantee. Broken, scratched, warped or discolored - JRP can repair your frames instead of costly replacements. Chips, cracks, burns or stains, JRP can repair or refinish to look like new again.